WARNING : ONLY FOR EYELASH EXTENSION EXPERTS/PROFESSIONALS! /PROFESSIONALS! THIS PRODUCT MAY CAUSE EYE BURNING OR IRRITATION. DO NOT USE THIS PRODUCT FOR SELF APPLICATION WITH INDIVIDUAL, CLUSTER OR STRIP LASHES!!! Best environment for eyelash extension is 25-28℃, humidity RH 45-55%. Once glue is opened, use within one month. Clean the nozzle of the glue thoroughly after each use. Shake well before each use from SIDE TO SIDE for 30-60 seconds. Store the glue in our silver zipper bag with silica gel. Air must be removed before closing the bag. Store the adhesive in an upright position at a cool and dark place with low humidity. If the adhesive is stored in a fridge, allow it to stay at room temperature for one hour before using. This adhesive is designed for eyelash extension experts only. Do not self-apply or use it with individual, cluster or strip lashes. Please make sure your clients keep their eyes closed tightly throughout the entire application process. Never have the glue come in contact with client skin or eyes. If the adhesive contact with the eye, immediately flush eyes with running water for at least 15 minutes. If redness, itching or a burning sensation occurs, see a medical professional ASAP. 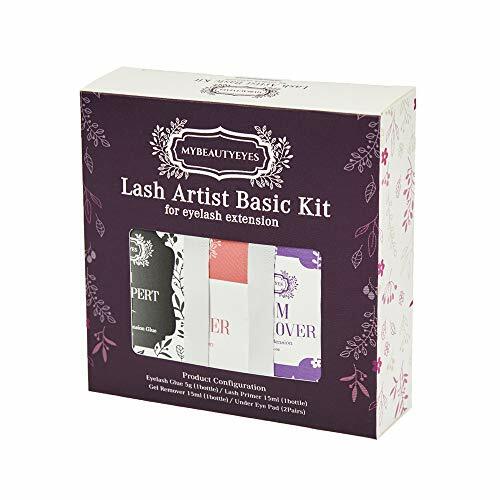 1 Economic Product Configuration : Mybeautyeyes Lash Artist Basic Kit is the most commonly used product for eyelash extension professionals and buying all the products in a package is less expensive than buying the products separately. 2 Glue and Remover: The glue that is included in the package is a product that has 1 to 4 seconds fast curing time and up to 7~8 weeks long lasting. And Glam Gel Remover effectively melts the eyelashes adhesive in a minute or two to help remove them more quickly and easily. Also, it can be used more safely with acetone free product. 3 Lash Primer: Glam Lash Primer is oil free cleansing product that increases glue adhesion to eyelashes by effectively removing oil and other oily substances so extension can last longer after procedure. 4 QUALITY ASSURANCE: MyBeautyEyes adhesive is LATEX-FREE. We are relentlessly pursuing the health of you and your clients by providing the highest premium quality products. This product complies with the ISO 9001(Quality management) standards and ISO 14001(Environment management) standards. 5 100% MONEY-BACK GUARANTEE: We commit to satisfying 100% of our customers every time you use our products. However, if you are not 100% satisfied with our service or products, just contact us. We are always standing by our customers to support and continuously seeking for new ways to improve.